The San Diego Chargers had topped the American Football League’s Western Division in 1963 and ’64, winning the league title in the first year, and were still considered the team to beat in the division as they opened the 1965 season on September 11 at home against the Denver Broncos. While Head Coach Sid Gillman’s Chargers were a good defensive team, they were best known for their high-powered offense. Fourth-year QB John Hadl had split time with veteran Tobin Rote in ’64 and, with Rote gone, was now the full-time starter – despite any misgivings on Coach Gillman’s part. 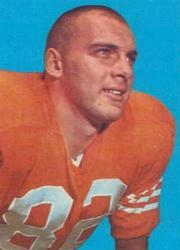 He had formidable weapons to throw to in All-AFL flanker Lance Alworth (pictured above) plus split end Don Norton and TE Dave Kocurek. There were concerns about the running game, however, as star HB Paul Lowe was coming off an injury-plagued year in 1964 and FB Keith Lincoln, a formidable all-purpose talent, would be sitting out the opening game with an injury. The Broncos had struggled both on the field and at the gate since the franchise’s inception and were coming off a 2-11-1 record the previous year. Former Cleveland Browns star receiver Mac Speedie was elevated from assistant to head coach during the ’64 season and there had been other significant changes. Brothers Allan and Gerald Phipps went from minority stockholders to majority owners with the promise of keeping the team in Denver, and the fans had responded by buying a record 22,000 season tickets. Two big names were also added to the roster in FB Cookie Gilchrist, who had worn out his welcome in Buffalo, and HB Abner Haynes, obtained from the Chiefs. There were still plenty of holes, especially at quarterback where third-year veteran Mickey Slaughter would be drawing the opening-game start. There was a crowd of 27,022 in attendance for the Saturday night game at Balboa Stadium. They saw the Broncos take the early lead on a two-yard run by Haynes. While Herb Travenio kicked a 32-yard field goal to get the home team on the board, Denver was ahead by 14-3 at the end of the first quarter following a 33-yard touchdown pass from Slaughter to flanker Bob Scarpitto. The momentum shifted significantly in the second quarter as the Chargers exploded with 24 points in 12 minutes. FB Gene Foster, subbing for Keith Lincoln, started off the barrage with a two-yard touchdown run. Travenio, who was successful on all of his extra point attempts, added a 25-yard field goal and then Paul Lowe showed he was back in good form with a 41-yard scoring run. Foster added a second TD carry of 17 yards and, while Gary Kroner booted a 37-yard field goal for the visitors, the Chargers held a 27-17 lead at the half. There was no scoring in the third quarter, but early in the final period the Broncos cut San Diego’s lead to three points after Slaughter threw a screen pass to Gilchrist that the big fullback turned into a 29-yard touchdown. The Chargers responded by scoring what would prove to be the decisive points of the contest. Lance Alworth, who had been making big catches all night, raced into the end zone to outmaneuver rookie CB Nemiah Wilson for a 38-yard touchdown pass from Hadl. With the successful conversion, it was back to being a 10-point game. Still, the Broncos had time and with 10 minutes left, they again closed to three points on a five-play, 66-yard drive highlighted by passes to star split end Lionel Taylor and Scarpitto and ending with Slaughter throwing again to Scarpitto for a 13-yard touchdown. 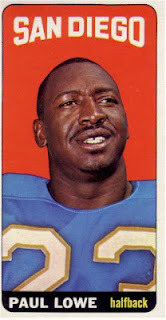 Late in the game, the Broncos threatened but Gilchrist fumbled at the San Diego 40 when hit by DT Ernie Ladd and DE Earl Faison recovered for the Chargers. Hadl threw one last long pass to Alworth, covering 46 yards, and San Diego was then able to run out the clock and win by a score of 34-31. With a preponderance of big plays on offense, the Chargers outgained the Broncos (459 yards to 330), but Denver led in first downs (21 to 19). San Diego turned the ball over three times, to two suffered by the Broncos, but also came up with four quarterback sacks while Hadl was dumped just once. Kicking also was a factor as Herb Travenio was successful on two of his three field goal attempts but Gary Kroner missed on two of his three tries. Lance Alworth had a huge performance, catching 7 passes for 211 yards and a touchdown. John Hadl completed 11 of 25 throws for 246 yards with a TD and an interception. Paul Lowe rushed for 124 yards and a touchdown on 18 carries and also completed an option pass to Alworth that covered 42 yards. Gene Foster played commendably in place of Keith Lincoln, running for 49 yards on 11 carries that included two scores and also tossing an option pass for 21 yards. For the Broncos, Mickey Slaughter was successful on 16 of 27 throws for 214 yards and three touchdowns with none picked off; he also gained 24 yards rushing on four carries. Bob Scarpitto (pictured at right) was his top receiver with 5 catches for 108 yards and two TDs. Cookie Gilchrist ran the ball 17 times for 49 yards and scored on his one 29-yard reception while Abner Haynes contributed 43 yards and a touchdown on 8 carries. The win signaled another division-winning year for San Diego. The Chargers went 5-0-2 before losing and ended up with a 9-2-3 record. However, they were stunned in the AFL Championship game at Balboa Stadium, losing for the second straight year to the Buffalo Bills by the improbable score of 23-0. Lance Alworth received All-AFL honors for the third consecutive year as he led the league in receiving yards (1602) and touchdowns (14, tied with Don Maynard of the Jets) while catching 69 passes. Paul Lowe set a new AFL rushing record with 1121 yards on 222 carries (5.0 avg.). John Hadl proved to be a worthy starting quarterback, leading the league in passing yards (2798) and yards per attempt (8.0). The Broncos struggled once again to finish at 4-10. Cookie Gilchrist was productive, ranking second to Lowe in rushing with 954 yards. Abner Haynes failed to hold onto the starting job at halfback while Mickey Slaughter shared the quarterbacking with John McCormick and Jacky Lee. Bob Scarpitto’s two receiving touchdowns against the Chargers were the first of five overall as he caught 32 passes for 585 yards (18.5 avg.) and also proved to be an able punter.